The management of my college is very good, food, CSR is also good. It is a good college. i think for my course -B.com i have chosen best college in my city. Moreover the fees in the college is also reasonable. faculty is highly educated. After all,every work or part is to be perfect there is no bad remark about my college. D.A.V. College, Bhatinda , one of the largest college of bhatinda, was established in 1969. is affiliated to the Punjabi University for B.A., B.Sc. (Medical and Non Medical) B.Com. BCA, Degree classes and PGDCA, Punjab school education Board for Plus Two stage Courses in Arts, Science (Medical & Non Medical) and Commerce.. The College has been accredited by NAAC. In College library more than 50,000 book available on Philosophy, Religion, Art, Science and Computer Science fields. I got admission in this college on +2 base. i like this college because its near to my house Comparing to other college in which i can get admission! I want M.sc IT in this college after Complete my B.sc Non-medical. 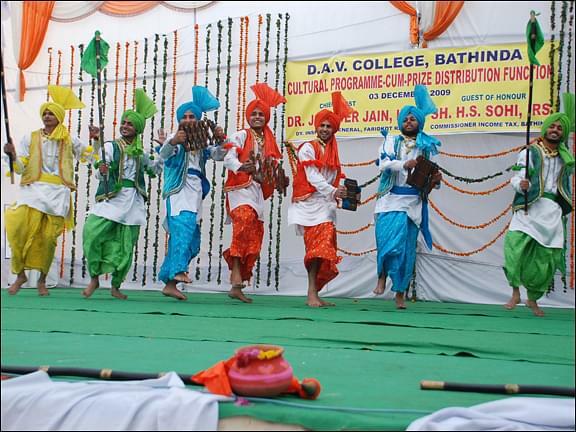 D.A.V College Bathinda very good for study. In this college admission process simple. Direct admission in college, due to some financial problems. No interview and direct entrance.